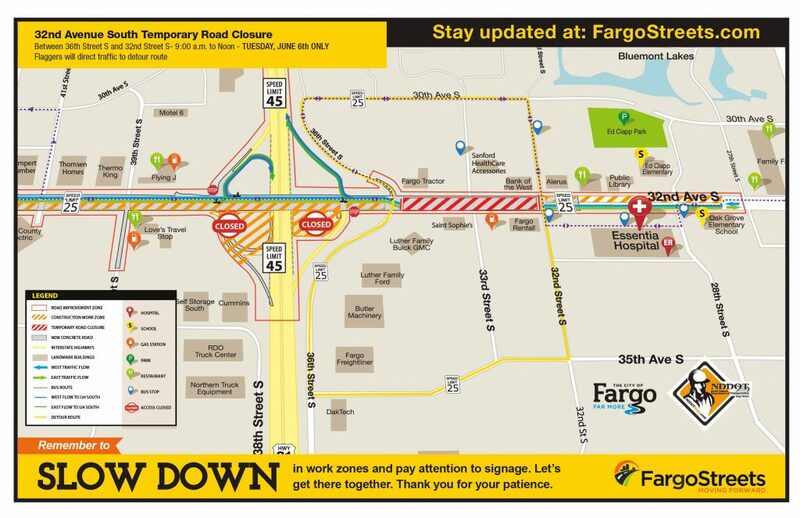 FARGO, N.D. (June 5, 2017) – Tomorrow, Tuesday June 6, contractors for the 32nd Avenue and I-29 bridge project need to temporarily close 32nd Ave. between 32nd Street S and 36th Street S from 9 a.m. until noon. The short term closure is necessary while crews install a temporary sewer pipe across all lanes of 32nd Ave.
All traffic will be detoured to 35th Avenue S using 32nd St. and 36th St. The intersection of 33rd Street S will not have direct access to 32nd Ave traffic and will need to use the detour route during the temporary closure. All other intersections, will remain open in the work zone, including intersections at 32nd and 36th St., so drivers can cross 32nd Ave. Business access will be maintained via side streets and the road should completely reopen for traffic in both directions in time for the noon lunch hour. After the road reopens, drivers will cross over a small asphalt mound across 32nd Ave., in place for the next three weeks. In advance of the detour, flaggers will be present at all intersections to assist in directing traffic along the temporary route. During the next week, contractors plan to prep for paving on the new, southwest loop ramp and could potentially switch traffic over the I-29 bridge. By the end of this week, weather permitting, traffic will move from the north side of the bridge to the south side, and the southeast I-29 on ramp will reopen for drivers. A detailed release and map will be distributed ahead of these upcoming impacts.